When a major disaster strikes a region, they need help in more ways than one. After an unprecedented number of wildfires recently broke out in neighboring counties to the north, our jurisdiction, the City of San Rafael, immediately sent our first responders to help fight the fires and assist evacuation efforts. As the days wore on since the first fires broke out the night of October 8, and the immediate need for public safety personnel and equipment decreased, we also sent help in the form of public information officers, building inspectors and planners. We were two of those secondary responders, assisting City of Santa Rosa staffers on the Public Information team. Once we arrived at Santa Rosa’s Emergency Operation Center (EOC), staffers there were exhausted. It was clear that the nearly-nonstop response efforts since the fires had broken out had been physically and mentally exhausting for staff. Some employees in the EOC had even lost their own homes or were sleeping on friend’s couches still evacuated; and they were pulling 12-hour+ shifts with no day-off in sight. Though we only saw the Santa Rosa EOC, this was not a jurisdiction-specific operation – it required many agencies in the affected areas to coordinate and work together in the response, communication, and eventually recovery in the areas where fires charred more than 100,000 acres across multiple City and County lines. If you work in a region where agencies work well together seamlessly – first of all, WHAT? And second, we don’t believe you. 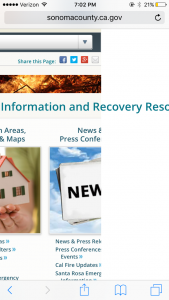 Because multiple agencies were involved, we quickly realized we needed one platform that all agencies could share and update, thereby providing a single, centralized place where members of the public could find the latest fire and recovery related information. We knew that we needed something up fast, and it needed to be easy not only for the public to find answers to the questions they were asking but also easy for staff from multiple agencies to learn how to use and update. So, we made a call to our friends at ProudCity. Within an hour, they set up a site for us to build out. Literally overnight, we created a concept and the next morning pitched it to the public information team. They immediately saw the benefit of a joint site so we continued to build it out based on information we culled from the existing websites, press releases and news conferences, social media, and the call center. One major thing we to our advantage for this task: with more than 14 years combined of government experience between the two of us, we are really freaking good at finding buried but extremely important information on hard to navigate and clunky government websites. 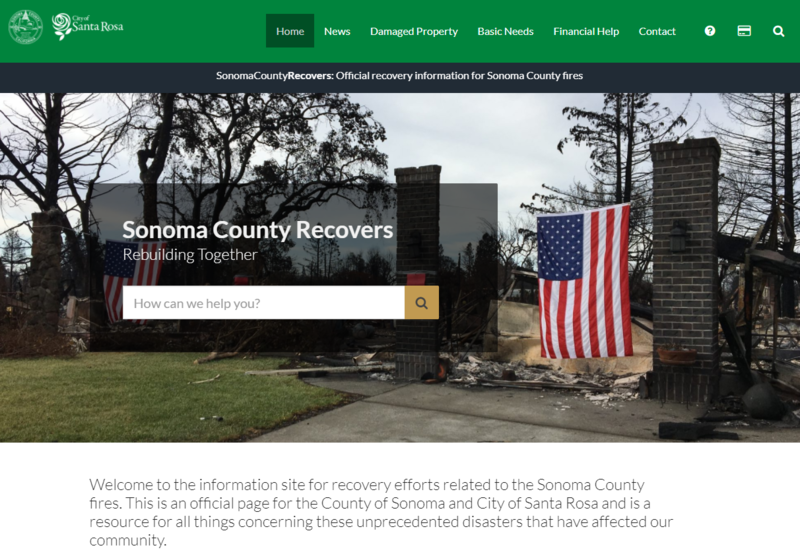 From FEMA to the IRS to Clerk Recorder information from neighboring Counties, we pulled out all information we knew those affected by the fires would need and put on our new one-stop-shop recovery website. Careful to not reinvent the wheel, we also surveyed other disaster relief websites created recently in the wake of Harvey and Irma and pulled any relevant information. Within a couple of days, after several very late night pushes and early morning caffeine headaches, we gained the consensus we needed from all agencies to promote the site and redirect their existing recovery webpages to it. Since the fires began, this was the first mobile-first platform to provide people with regional information about evacuation area re-entry, debris removal, and official disaster assistance resources. Map “hub” with easy links to a variety of maps released by different agencies, including before and after maps, structure damage, road closures, etc. In addition, based on this work, ProudCity is building into their platform a template for emergency situations so agencies can quickly stand up a go-to-site for timely and relevant disaster-related content. Since we launched the site a week ago, there have been over 20,000 visitors. Over 5,000 page views for Debris Removal, almost 3,500 page views for Damaged Properties, and the most popular search term is ‘Volunteer.’ About 50% of the site users are using a mobile phone or tablet. The ‘Answers Box’ is also getting a ton of traffic with almost 1,000 clicks on the ‘Re-Entry & Debris Removal’ category. October 28 was the first real day off for the both of us since the fires began on October 8. 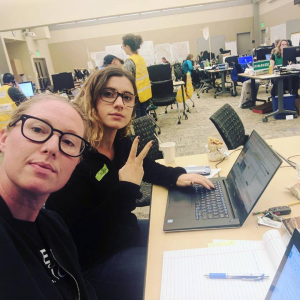 Strangely though, we miss the buzz, hustle and unparalleled feeling of compassion and support in the Santa Rosa EOC where we had spent nearly a collective 100 hours over the last three weeks. More than 40 City of Santa Rosa employees had lost their homes in the fires, and yet despite this, stayed unwavering in their commitment to service to others in this disaster. During one of the shift changes at the EOC, Santa Rosa’s City Manager Sean McGlynn read a heartfelt a note of thanks from Mayor Chris Coursey. Mayor Coursey’s note ended with a short story: after attending a town hall meeting with local state and federal representatives, Coursey elected to walk home; he needed the exercise and a breath of the cool night air to clear his head. As he neared his home, a young police officer pulled up to the man on the side of the road, asked where he was going and if he needed a ride. “It seems that everyone just wants to help. Everyone wants to do their part. In this worst of times, we have shown our best to the world. Our residents have come together for each other with sympathy and generosity and service. And you, our employees, have stepped up in ways large and small, wherever you’ve been needed: no task too big or too small,” read Coursey’s note. Times like these truly remind us what public service is, and make those in it prouder than ever to be a part of it. SonomaCountyRecovers.org was two analysts from the City of San Rafael just wanting to help, and we’re damn proud to have had the opportunity to show our best to Sonoma County.